The glues-on label seen though the f-hole says my guitar is an HB-35, serial number 821197. Headstock says it's an HB-35 DL. The inspection checklist and warranty card both say it's an HB-35 DL-TS. It has Seymour Duncan pickups and an on-board parametric EQ. It never came with an instruction booklet and I can't remember how the EQ is set up. 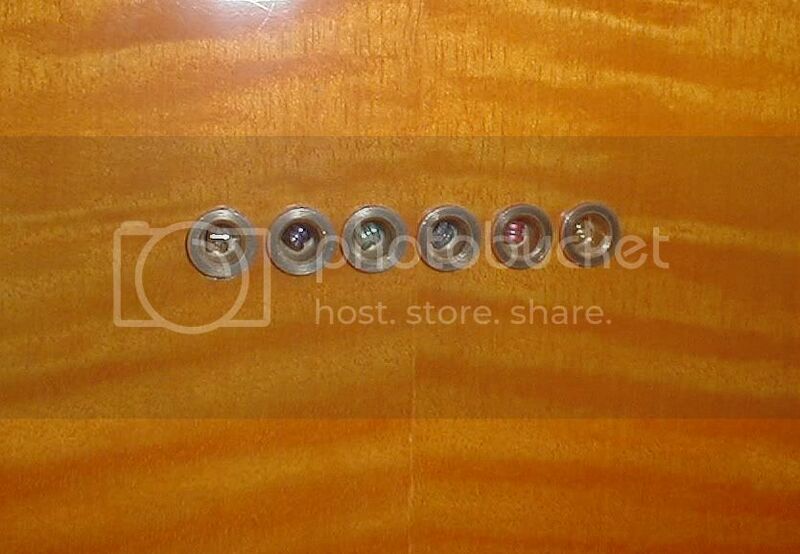 That is, which switch kicks it in, which knobs do what, etc. IIRC, the small 3-position switch centered among the knobs selects between a wide and narrow bandwidth. Does the center position turn the EQ off and either of the other two positions kick it in? With the EQ on, one of the four knobs controls volume (that much I remember). I also remember that one knob sets the frequency of the EQ, another sets the amount of EQ, and the fourth one... does what? Can anyone tell me which knobs do what re the EQ? Since it has SD pickups, they have been changed, and it's probably been rewired. Nothing could be stock. The best thing to do is plug it into an amp, and play with the controls to see for yourself what does what. sweet! Only ever seen photos. I wish I could help you out. I envy you the problem however. clearly a MIJ guitar, and a GREAT guitar. Is it a string through bridge, or tone pros style bridge? Tio, that's it! At least, the one on the left sure LOOKS like mine. The strings come up from the back, through the body block, and out and over the bridge-pieces. Gold-plated Gotoh OEM tuners. 7-ply body bindings. It's a sweet axe. But until I have my hand surgery, I can't play it!!! You say it's clearly MIJ. How can you tell? Any idea of the year of manufacture? The string through HB-35's were only made in the early 80's. 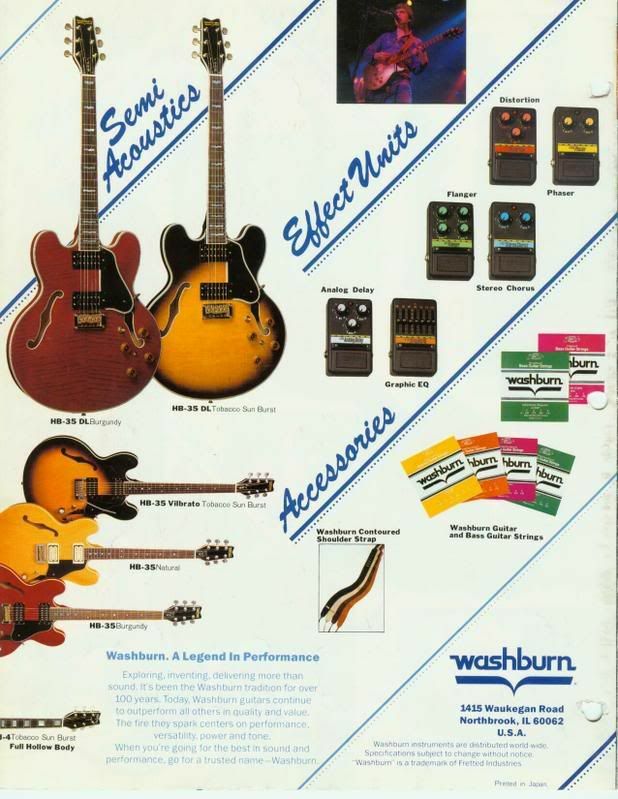 At this point in time, all of Washburn's Electrics were being made in Japan. Which Japanese manufacturer is a subject of debate and speculation, But MIJ is a fact. These have excellent build quality, easily rivaling the production models of Gibson that you'll find in GC's etc. 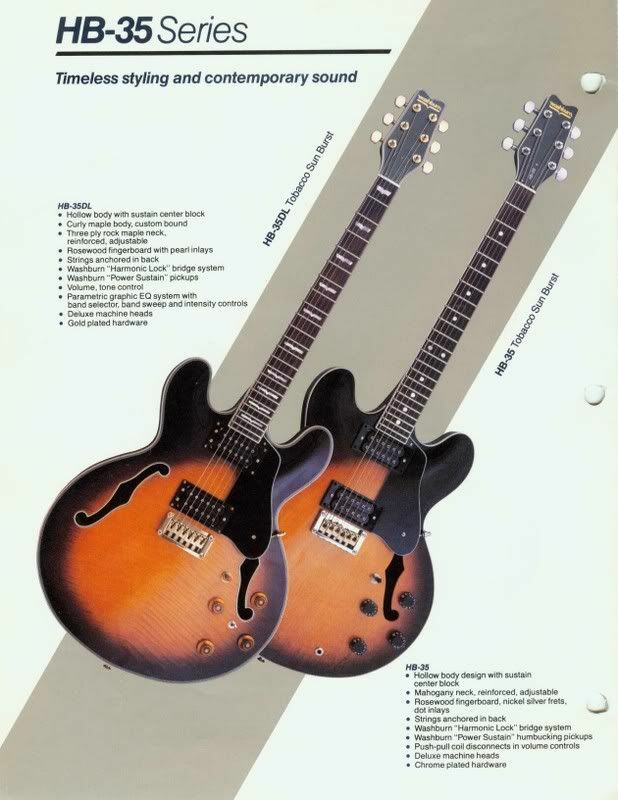 That flyer, for example is from the 1982 catalog. By the end of the 80's they no longer offered the parametric EQ and they were trying other countries manufacturing sources. 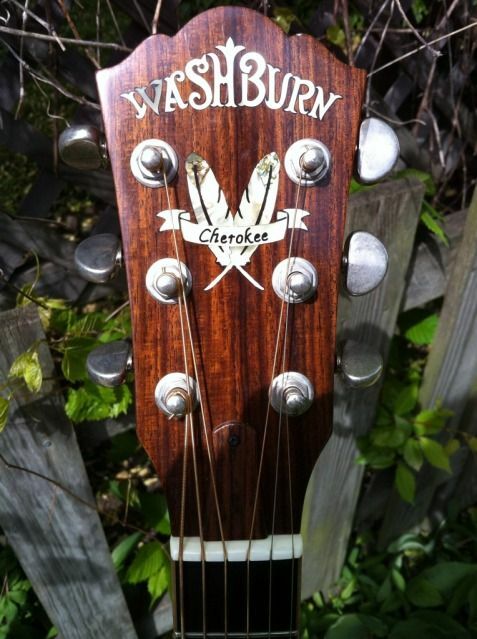 If they're the stock Washburn p'ups, that's not a terrible thing, and easy to upgrade should you choose to later. What's the story on it coming to you? You're the original owner? Thanks for the info! Apparently, I was mislead about the SDs, because I'm the original owner. No, I'm not interested in an upgrade -- I'm happy with what it's got. Yes, I bought it in the early 80's, but I honestly can't remember which year. I have the tags and stuff, but not the store receipt. (Darn!) Re comparison to Gibsons, it's funny you should mention that. I walked into the store intending to buy a Gibson 335. I walked out carrying the Washburn. Pics? You've got the catalog pics. What could I add? Originally posted by Bob G.
Well, it's not entirely inconceivable that the shop elected to upgrade a new instrument, unlikely perhaps, but certainly possible. Like a dealer installed option. Maybe someone ordered it, then backed out. Wouldn't hurt to look. Pics of your own guitar, in real time. Is it appointed as these are? wing headstock? bound f holes etc.. It's always nice to see a 30 year old guitar that's getting some love. This SHOULD be a pic of the back, where the strings go through. Hey! It worked! Having a tough time with the light in here, though. The flash blows out everything. I'll set up some photo lights tomorrow and take some decent pics. If you enjoy seeing a 30-year old axe, you should have seen some of the stuff I got rid of over the years. '67 Martin D-28, '74 Guild F-412, and, my favorite-est of all time, a '47 Epiphone Deluxe Zephyr Regent. (I used to play jazz and the Epi was a suh-WEET jazz axe.) All but the Epi were bought new. All I have now is the Washburn. To answer your questions: yes, it has the wing decal on the headstock, just like in your catalog pics. Wing inlays on the fretboard, too. The f-holes have 3-ply binding. It really is a nice guitar. Its tone could get pretty darned close to the Epi's (you know, that fat, round, jazz sound), but it's WAY more versatile. With the wood block running through the body and the strings running through the wood, the sustain is... well, you know. You could hit a note, go out for coffee, and it's still ringing when you get back. And you could get just about any tone with the EQ. I'll take some more pics tomorrow. That is one nice guitar. I kind of wish Washburn was still making them with all the options. Split coils, EQ's etc.. I have a newer model that I really love. Hope your surgery goes well. Thanks for the kind wishes. I'm told the surgery is routine. Mine doesn't have coil taps, but it's still a sweet machine! I've always LOVED it! Can you tell me more about your newer model? I confess... I'm ignorant. It's a 2009 HB35 in Wine Red. I have a link posted below to the pictures. I picked it up new on Amazon for 420.00 with the hard case. The pickups are a bit darker in tone than yours are. I just turn down the Bass and Mids on my amp to get it to sound just right. The bridge is a basic Gibson TOM style. It was great right out of the factory box. Fit and finish top notch. 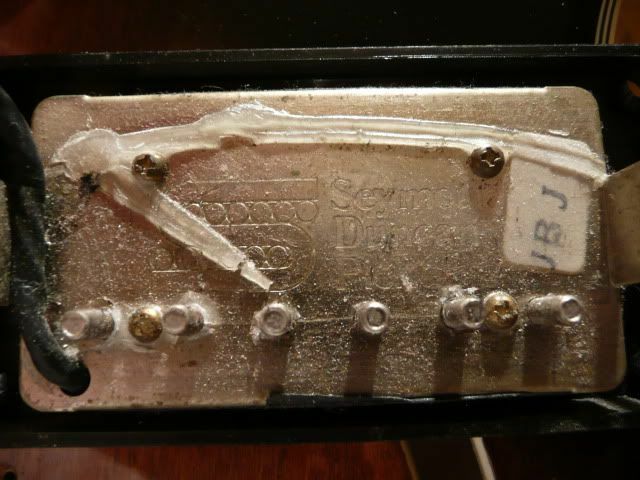 The neck pickup could be a bit brighter ie. Vintage in tone, but I get buy. Darker is not all bad when playing the blues. That is one beautiful axe! That's my favorite color for a 335-style guitar. And I prefer your headstock & fretboard inlays to mine. But, IIRC, I paid almost TWICE what you did -- back in the 80's!!! $700+? $800? Always wanted to play The Blues, but I'm a jazzer at heart. I can play a Blues, but I've never been able to play THE Blues. It always comes out the way a jazzer would play a Blues. I just can't get away from 13ths and min. 11ths. (They're easier to play, and I guess I'm just lazy.) And my phrasing is stuck in the jazz mold. Jazz comes from the head and the heart. Blues comes from the guts. It's all about attitude. Some folks got it and some folks don't. Unfortunately, it seems I don't. But I LOVE The Blues and wish I could do it. I'll try to get some pics of mine up tomorrow. You know what they say about Jazz Players - there just frustrated Blues Players with attitude.